Was going to type something wonderfully witty, because maybe this is the first comment, but l can’t think or type for laughing! I saw you fox paws scarf. I have the pattern, learned the stacked increases and can’t get the 2nd row to work even in a swatch. I thought I could knit anything. I live in Seattle. I’ve read all your books. I need help. Normal for a knitter, yes, and probably a miracle. Particularly if Joe goes downstairs…. Who could resist that kit…it is beautiful! Too bad it is not in their Etsy shop. I asked about this before the festival as she has these amazing heart fingerless gloves I wanted to knit… and she said if any are left over from the fibre festival she was attending she would place them there, but I’ve checked and I guess not is the answer. Please send me a message and I’ll make sure you get the set you want, I’m still at shows for two more weeks! She just finished something like three fiber festivals, so her shop should be getting updates shortly. She announces them in advance in her Rav group! 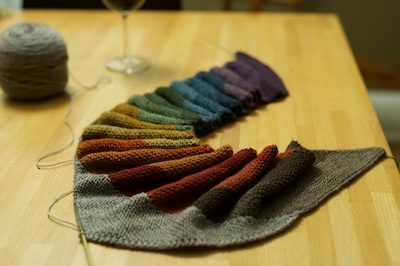 That’s fabulous, because the mama of two LGBTQ young men, I have a burning desire to knit myself one of these shawls, and I am not even a shawl person. So gorgeous. XOXO. Just take my money now. Oh ho! That is totally how I am with yarn purchases and stash. You nailed it. Although…. I can see why you picked this kit and started it… it’s all the various colors. No color (yet) long enough to let knitter’s Startitus crop up again. I operate my purchases and stash in a similar way, although mine accumulate in a knitting bag behind the den door until I realize they need to go downstairs to make room for the next purchases. 🙂 The shawl is very beautiful! It’s a design I would use, practical, warm and pretty. I’ll save it until I”m out from under the wips! That totally deserves to be next. It’s beautiful. Beautiful shawl, and kudos on following your plans. This. Yes, this. It is my life. Totally going to be next. Unless, of course, it’s not. I’m so proud of you! Someday I hope to knit the last thing I bought. No firm plans, but I hope someday it will happen. Steph… you are knitting EXACTLY the thing my heart was looking to knit next, but wasn’t sure what it was. As soon as my eyes lighted on this post, it was all over. Beautiful. I’m going to go cast on one of my own now. I just bought the pattern, anyway, so all bets are off! LOL! I JUST saved this pattern yesterday and hadn’t even read this post yet. I bought mini’s from the festival we have here in Kitchener, Ontario (Canada) every September at 2016’s festival. I just loved the colours SO much and thought “something will come up in Ravelry for these” and yesterday, I found this exact pattern! Absolutely nailed it. This is definitely me (except for the part where it really is next). 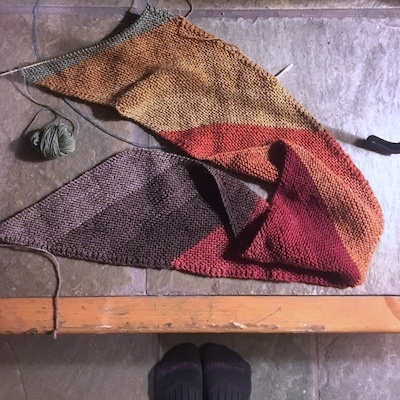 Closest I’ve come (other than an emergency purchase for a particular purpose – a baby shower, for example) is that I am now finishing up a shawl that I bought the yarn 2 years ago after seeing a completed one at Stitches West. If I do manage to start something close to when I bought the yarn, I usually have startitis or another emergency (baby shower) so it does not get finished in a timely manner! Kudos to you – it looks like you will finish this shortly. Is the main color blue (as appears in the skein photo) or grey (as appears in the WIP photo)? I have to say I was unimpressed when I clicked over to Rav to look at the pattern, but your version and that rainbow of colors is gorgeous! Laughing almost too hard to type… SO like me! But oh wow, that is SO pretty! My “next” yarn sits in a pile next to my TV chair, until it gets buried. Sometimes there is even a pattern in with it. Thank you for reminding me I am a perfectly normal knitter! Nothing to see here, move along! HI Steph. I first wanted to address your post about resilience. Yes, we are strong women, and we are indeed resilient. On Father’s Day, 2015, my son’s father hung himself, after years of depression. I thank the universe that my son got to see him that day. I grieve for the psychic pain the man must have been in to make that choice. Now, on a happier note, I vaguely recall taking many luxury skeins purchased on a LYS sale to a craft store to purchase matching beads. I am now making shawls and wraps with those yarns and beads and it brings me such pleasure; it is all so beautiful. I want to keep them all to myself but figure most of them will go to my as yet unopened Etsy shop. I hope others love them as much as I do. Omigosh. I swear just about every time I read The Blog, I think “Stephanie must be a mind reader!” Because, of course, every knitter is Unique, so these noted coincidences must be ESP. Congrats on Sticking With The Plan and such a pretty pattern. Perhaps now as the Earth has rolled on its axis in a completely new angle, stashes all over the world will sift and sort themselves according to procurement date. Given the cultural importance of a carefully curated collection of High Times, perhaps the local library would insist on maintaining the collection so it can be preserved for all time. In Joe’s name of course. The only problem with that amazing event would be (assuming it led on into them actually being knitted!) is the number of LYS and on-line stores which would go bust in the next few months! They survive on our stashes! I didn’t have a stash until a wonderful LYS opened – unfortunately even I couldn’t buy enough to keep it in business! Oh I have a skein of Cannon with a little yak in it and well, the colors are stunning aren’t they? Glad you dived in head first so Joe would believe that sometimes you do knit it next. That’s like buying something at Stitches and actually having it ready to wear at the following Stitches (the next year, not the very next show). I’d go weak in the knees if I saw that combo of mini-skein too. I’d probably abandon all my other knitting for that scarf, too. I’ve done the next thing a few times now, but most yarn is bought with the knowledge it will head straight into stash for its turn marinating until mature. Oooo! I love that! Marinating until mature! YES! That is why I have so much in my stash! It is marinating!!! That explains my stash in the garage, bookcase, tv stand shelves, and 2 huge boxes in the living room, as well as the 3 shelves in my bedroom! So grateful to understand what’s happening! Has absolutely nothing to do with saving up for my retirement years! You mention alternate universe….which brings to mind an agreement that my husband and i have…..if a portal opens up to an alternate universe…..he or i (whomever it opens up for) will walk through it-no questions asked-no issue…knowing full well if it was the other one of us they would have walked through too without a by your leave. Maybe the portal just opened a little for you that day. Pssst, Joe. Yeah. Over here. When you’re in the basement, bring up some of that raw grey wool and leave it on top of the knitting basket, kitchen counter. Mwwaahaha! Love it! Joe’s too nice / smart. We need to bribe one of the family who don’t share her bed to do the dirty task. Stephanie, I’m re-reading all your blog posts from the beginning. Just finished March 2010 when I saw this post. Would love to know how FOs from the past have held up to time. SNORTS. Wouldn’t the joke be on us if Joe has been wearing that guernsey this whole time? If Joe is like most of us, the darned thing wouldn’t fit him any more and would have to be reknit from scratch! Isn’t it curious that most of us do this? Knitting for charities is a big thing with me and probably my worst stash downfall because I know the need is great and I so want to make things for people in need, yet the stash (fleeces, yarn, knitting tools) just grows and grows. It’s a rare day indeed when I buy yarn and start knitting it same day so well done to you, dear Harlot. The shawl/scarf/cat blanket thing is gorgeous so far. It’s no wonder why you actually made it your next project after buying it! However, it’s not the only knitting miracle at your house. The real miracle is that all the yarn left on the kitchen counter stays stain-free! Per usual I’m laughing too hard to make coherent reply. My head is nodding up and down, though, which has to serve. Gorgeous colours, gorgeous shawl. Is that the same one which you were knitting on the plane? Yep. “Next” doesn’t really mean “ the very next thing”. Because there’s next month, next year, next decade…. I do not do this. I come home and grab the needles and start knitting right away! REALLY! My problem is after several rows I put it down and it ends up in a drawer with the needles still in it. I have many projects (or did, before the Ravellenics Aerial Unwind) that I frogged and found so many sets of needles! I now only have 4 (I think) things on the needles. Plus that next one I want to cast on with the new yarn . . .
My eternal question is when does the yarn become “stash”? At what point does it stop being in the queue, and become deep stash? There seems to be no answer. But I do know that the only real way to reduce stash (because it just keeps coming back) to say nothing of those magazines in the basement, is to sell your house and move. It kind of forces you to confront the issue head on, but if you are not willing to take that drastic step, than you have to just become one with the stash, and accept that it is a part of you and of your life. Those magazines, however, are just mold now…they need to go! Lol! You have filled my heart with hope! If you can do it, any of us can do it. Ha ha, a young man who asked me to teach him to knit (and he’s fantastic at knitting) told me if I would just only knit the yarn I already had that it would clear out my house considerably and THEN I could buy more yarn, but only what I was going to knit right then. He gave me a good laugh that day. As to keeping magazines and the like….my dad saved ever Dallas Cowboys Newsletter he ever got, two piles of newspring taller than my head. “Daddy, why are you keeping these? ?” His reply, “They’ll be worth a lot of money someday!” Me, “No daddy, they will be a big bonfire when you die!” And that is exactly what happened to them seven years ago. Now the stash of crafting stuff I have? That is another story altogether. There will be a whale of an estate sale when I go! Srlsly, Geraldine, you might consider naming a yarn executor in your estate planning. I Am Not Kidding About This. Name someone who understands the worth of your stash, and who will treat it with the respect it deserves. Otherwise some well-meaning relative might just donate it all to the Goodwill or (gasp!) throw it away. Yes — luckily 3 knitting friends and I cleared a friend’s house upon her death. We took several large bags of yarn to knit into charity projects, and before we returned to the house for ‘phase 2’ – an opportunistic interloper came and scooped up the remaining (and desirable) yarn that we had rounded-up…for resale through her shop… DO consider a Yarn Executor!! I have given my husband strict instructions that the yarn is to be given away at my funeral, and I have shared this with my knitting group to be sure it happens. I want it to go to friends and not end up in something shop! I was sitting here smugly thinking that this isn’t me at all (most of my stash is my late grandmother’s leavings) and then I remembered the time I made an ’emergency’ trip to get cable needles so I could start my first cable project. This was probably about a year ago now, and I haven’t so much as cast on. Oops. But then there are things which you buy because they’re a great deal (enormous cone of fine yarn for $5? yes please!) and you’re waiting to find out what they’re going to be. They’re not Next, and they don’t need to be. I think that “next” has a far broader meaning than your post would indicate! That pattern in those yarns-gorgeous! Every year I buy yarn for my friend for her birthday. It is so tough to buy for others, but this year I knew I had chosen the right thing because she Cast It On Right Away!!! Oh! That’s pretty! I’d totally knit that next, too, except for the Malabrigo Rios I just bought last week to make a specific and challenging cowl, which replaced a different cowl I was going to make next. Yeah, we all do it. I have fallen in love with the phrase “into the canopy of the stash.” It is exactly what happens. The stash has its own archaeology. First, I am so sorry about your terrible losses. Thank you for sharing your words and pictures with us. Second, It is good to know that other people do the same with their stash. Third, My sister started knitting again after learning as a kid. She has made 6 toddler sweaters for her granddaughters. When I asked her if she wanted some of my stash, she said ” no, I only buy what I need for what I am making, I don’t want extra yarn” !! *gasp* What is wrong with your sister?! There’s nothing wrong with her sister at all. Many of us started like that. She is only a beginner. Give her time; give her time, and expose her to yarn that’s all it will take. In a decade, if she sticks with it, she will have stash too. How right you are, I bought a pattern and nice wool a few months ago, to be my next make. The pattern was at the top of my Ravelry list, I think it’s down to number 5 now. I’m trying to finish a cardigan at the moment, though I have cast on a hat. I loved your monster pants, they looked great on your grandson. Wait. We aren’t allowed to talk about the Ravelry Que. Mine is 18 pages long and has 518 items in it. One of these days I’m going to go through and purge out the things I don’t plan to knit anymore.. but really, they are all on my “someday” list. Don’t fret. You are just a beginner. My queue is over 1,000! Oh, but that I could live long enough to actually knit them all. I just noticed that my Rav queue is nearly at 1800. I now browse it instead of the main pattern page. I love it that your toes show up in that one photo. I always do that. That is lovely and I’m glad it didn’t get buried in the stash. I’d say your normal practice is pretty normal for many of us and it’s probably why my stash has grown as large as it has. I love the phrase “canopy of the stash.” Perfect! Beautiful shawl, by the way. Is it just me, or did your inner Junie B. Jones come skipping out in the middle of that post? I knit this last spring! I loved making it (felt like it almost knit itself) and the Canon yarns are wonderful. I bought another set that’s aging in my stash until it’s ready for use (like fine wine). Oh yes, yes, yes! I told my husband that this post was like reading my own mind. I’ve got tubs of yarn in my stash but I also have tubs of “this is next” where the yarn is bagged with pattern and sometimes needles, ready to grab and go! Somehow those tubs are added to instead of depleting. Yet every single project was set up to be “next” Sigh. Okay, started it didn’t really impress me, as a person with chronic startitis. But if you finish that I think champagne is called for, and a very self-satisfied gloat. Don’t weaken. You know we may all be in one of those voids where strange things happen. I bought some yarn, not even a month ago and now that yarn is socks…It may be Sock Madness, it may not. Whatever it is I hope IT continues! I have to confess, that while I entirely understand the habitual new yarn becomes stash because of more new yarn, my new yarn usually becomes stash because when i get home with my lovely new yarn I realize I have lovely stash yarn that has been sitting patiently, waiting for me to make it into something beautiful, and I cast on something from the stash instead… (especially strong pull when the stash yarn is a gift from my wonderful hubby, and he is wonderful at picking our yarn for me!) There are of course exceptions, and coming across that lovely set of yarn would probably have the same impact on me it did on you! Looking forward to seeing your pictures of the finished shawl! Happy Knitting! I have reached SABLE. So, before I go to a fiber event, I shift some of the SABLE around. I am even bagging SABLE with the pattern I intended to knit. I actually went to my last fiber event, and took a BIG CONTAINER of yarn that I will probably not knit to donate to their charity knitting projects (although, somehow, the purple DK that I had mixed feelings about jumped back into my car and did not make the trip). So, for the most part, I have not been buying much yarn. I have had some fiber follow me home…especially if it is a day that I am particularly feeling “spinny”. But I am so glad that you bought that kit and knit it immediately. When I buy, I am trying to avoid those “one skein wonders” and buy fiber/yarn for which I have a plan. Now, like you, to move it into the production phase as well. I am much more interested in what appears to be at least a couple of skeins of blue yarn beside the kit. What is it and what is it for? It’s such a beautiful blue on my screen. One of my problems is never being able to decide which pattern I want to use for some yarns, usually too many choices for that lovely 1 skein. so this winter I paired up several small, 1 or 2 skein project patterns with stash yarn to go with them and arranged them in a basket where I see them all the time so I will know just what to grab for my next traveling project when the big things I am working on get too unwieldy or complicated. 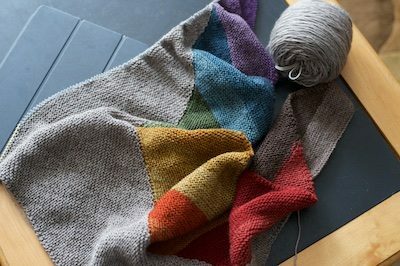 I love this shawl, it looks like just the perfect project for a mini skein Advent calendar project. And yet, occasionally the unthinkable happens, and we cast on right away! So I completely understand! P.S. That shawl kit looks absolutely gorgeous! In case you thought it was only about yarn, let me assure you the same thing happens to fabric. I’ve been buying new fat quarters to make a “scrap” quilt because my scraps just aren’t interesting enough! Oh, man, such a relief to read this!! Can’t stop laughing, all the more since only this morning I went out and added to my stash — and that’s after having found a real bargain yesterday…. You speak of ‘stash’ as though there’s only one, but I seem to be totally surrounded by yarn. I’m not even going to bookmark that gorgeousness you’ve started, Steph: my Rav is too full already! But — well maybe. OMG This is my life! Please wave the “next” wand over my list. Each year I look at the list of things I REALLY want to do, complete a few, complete a few other things and rewrite the list for NEXT year adding..some new ones. I need someone to wave the wand over here. This story did not go where I thought it was going! I thought you were going to bring home your kit and find that you already owned it. Hehehe. OMG THANK YOU. I have this really crazy variegated skein of Knitted Wit in a rainbow color and 8 matching miniskeins in solids used in the main skein. I’ve been looking for YEARS for something to make with these, but until recently mini-skein patterns weren’t really a thing, but this is perfect! I suspected we were kindred spirits. This post confirms it. It’s like you can see into my stash…..
Time to move some skeins of yarn from the dining room table to the top of my yarn basket. I’m going to knit them up next. Really. I am. I’m not sure how you do it, but you describe my exact knitterly thinking every time. Are you in my head? I love that things like having a stash and buying yarn that then, despite our best intentions, ends up in the aforementioned stash is considered completely normal here. Living in a small town in Australia means that none of my IRL friends are knitters. They are, shall we say, surprised at the size of my stash (and they haven’t even seen all of it!) 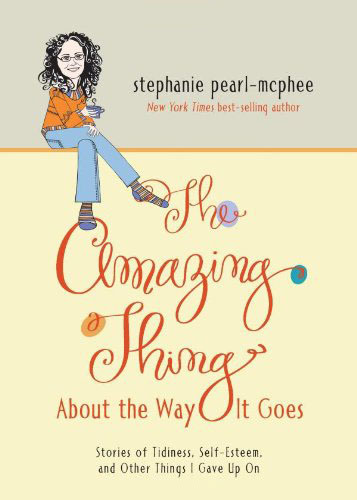 It’s so nice to have a place where people understand and where Steph brings it to life in her writing so perfectly. I so enjoyed this installment of the blog … my stash is ginormous to say the least. I think the acronym SABLE (stash acquisition beyond life expectancy) was created for me – I keep a spreadsheet of my stash and the yardage total is automatically converted to miles … it was around 150 miles when I put myself on a yarn diet some years ago and somehow, the stash now sits at 175 miles! 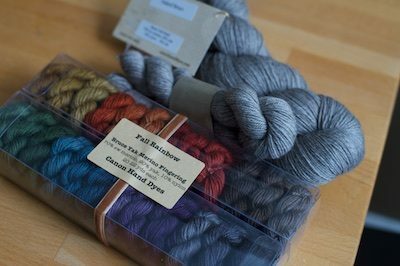 And Steph, you might have explained the stash, but you, too, are an enabler – I saw your Russell Street and placed a pre-order for the kit!! Very bad all around!! Knitting the next project that was actually supposed to be the next project, and knitting it all the way to completion without relegating it to the *PWIP bin? This is an alien concept to me. Like, HOW DO YOU DO THAT??? Ooh, PWIPs. I am adopting this term posthaste! This thing you have done is called intermittent reward and it is one of the most powerful things ever. For a long time to come now, you will look at new yarn and say, “Remember the time I DID knit the new yarn next?” and you will buy that yarn, take it home and move it off the counter to stash. This isn’t bad, it’s how casinos take our money too, but I wasn’t aware until this moment that this is the reason I have stash that has stash. Any ideas for yarn for those with a tight budget? Thanks. If you give your friends knitted gifts they will give you yarn. Sometimes things they bought and sometimes interesting things from yard sales in 70’s colors you can’t buy any more. Haunt the thrift stores – every single one you can find! Frequently ones run by or for religious groups or schools will have the best deals. Case in point – please don’t share this with my hubby – 3 Friday’s ago I bought yarn for $230 that has an approximate retail value of $850. I went back to the same store on the Monday (just in case you understand) and spent $65 on yarn that retails at about $730. My budget would not allow me to spend those retail dollars, but . . .
You must be prepared to go frequently, you must be familiar with the names and makers of good yarns and you must know what the good stuff looks like so you can identify it at 10 paces. I freely admit that I am building stash for my retirement – even with these kinds of deals I may not be able to afford the good stuff by then. On the other hand I also share (or trade) what I find with family and friends and the ladies at my church frequently get yarn for charity knitting. Hahaha, so funny! This is EXACTLY how my fabric stash came about. Nice to know I am in good company. You’re talking about my yarn purchases, right? And my stash? Because that’s kind of how it works in my house….although yarn rarely sits on the counter because Husband does not know how much I’ve spent on yarn or how much yarn costs (bless his heart)…..but I totally have an envelope sitting on the floor next to the project bag it will go in (I’m running out of yarn on a blanket and, of course, the dyelot and the yarn are impossible to find and I found a lovely woman on Ravelry that sold me a skein from her stash with the same dyelot…I might be able to finish this blanket)…..and there are the project bags with my “this is definitely next” projects…and I’ve started none of them. To be fair, I’ve been super busy. I might clean today. I think I need to. You totally nailed my stash building process, except with me it’s fabric and patterns. I’m always positive I’ll sew those up right away. Very Shortly. Soon. A plain garter knit scarf is probably much appreciated by your non-knitting friend this Christmas. Go for it! That’s how your skills improve, too, BTW. Too true- and a plain garter knit is a often a great vehicle to showcase a lovely yarn. Very pretty colors on that shawl. Maybe you need to go online and pick another of her options for next? I have 17 big plastic totes (each with its own moth repellent) full of yarn skeins that were all going to be next. I know exactly. I have 50+ WIP’s so I try valiantly to get it all knit up. What I need is a granddaughter who learns to knit and raids my stash. Maybe Elliot will learn to knit…WE’ll see. Give him a few years. 17? You make me feel so virtuous! I probably only have 10 (lots of smaller containers). What do you use for moth repellent? That was the biggest enable I’ve ever seen – Thank You! Something similar happens to those who love to read books. Even when they attempt to avoid popping into a bookstore just to browse, someone will mention how great a book was that they just read, or they’ll hear an interview of an author on the radio, or come across a book review in the newspaper, and before you know it they’ve bought yet another book. Usually it ends up in the pile of books waiting to be read, but once in a blue moon it will actually turn out to be the next book they read . . . while all of the other previously-purchased books marinate. I enjoy reading books printed on paper and also enjoy knitting, but the two can’t be done at the same time, so one or the other suffers. Hence the stashes of books and fiber grow, waiting to be enjoyed, each in its own time. So, so true. I’ve actually taken to adding the ‘books that look interesting’ to a list to look for later instead of piling them up to read now. So at least the pile of books beside my chair isn’t growing. Much. Because my husband keeps recommending things. And we’re not even going to talk about the 6 x 6′ bookcase in the bedroom full of ‘to be read’ books…. You can get a thingy that holds books open for you. (A little plastic thingy that looks like an inside out coat hanger. I have two sizes (paper and hardback) and it’s how I learnt to knit and read before Kindles were invented (I use a kindle, too now, but if you like paper books, these are excellent. I bought them at a bookshop, about ten years ago now. I can knit (and purl, although it took longer to master. I initially learnt knitting in the round on sleeves) on the straight bits. Search for ‘book clip’ on Amazon to see something similar. I can absolutely relate and you are hilarious in the way of describing it. Beautiful pattern/kit! And that’s what makes it impossible to break the habit. Every blue moon I, or someone in the universe, actually does knit it next! Well, hell, I looked at that pattern and thought “I’ve gotta get me some of that!” Thanks so much. LOL. Every now and then, I go through my WIPs and do a serious review with some painful questions: 1) What is it? 2) Is the pattern there (see question 1)? 3) Why did I stop (oh wait, something new hit the “next to be knit” and pushed the poor thing down)? If there is a no, to any of these questions (usually its because I can’t find the pattern), then it gets re-balled and delegated back to stash, the needles get put away and, if I am lucky, two months down the road, I’ll open the drawer and be enthralled with the yarn again . . . . now all I have to do is find the right pattern. Wow! Easter yesterday and now I read this miracle! The world looks better! When I find some things I’ve moved around but they’re really good I sneak them over to my daughters stash when I’m there to keep Liam. She probably knows but she doesn’t complain! That first sentence may be the funniest you’ve ever written. So glad you can still do this! Also, no such thing as too many baby pics. Joe – keep the magazines. I’ve been moving the same box of High Times magazines with me for 35 years also. You know they’re going to be worth a lot of money some day . . . Right? I just mix the box in with my yarn (and fabric) stash until the time is right. You really should add a few tiny ads to your site….with your irregular posting schedule, I check it several times a day while I’m at work and usually once at home too! You could make a bunch if people are as not patient as I am! I just saw my first video of you knitting armpit style. No wonder you can get those knits done so fast! I’ve borrowed some strait needles and I’m gonna give it a try! I stopped doing the “buy it cause it will be next” thing after I could no longer afford it. Now my stash is being used for other things that I never got around to making and never will because I now weight too much and the patterns will never fit. That is how long I forgot it has been since I said I would do “the next thing”. I now know I will not ever do what I said I was going to do. The stash is now being used as fabric warp and weft to make fabric for clothes that will be made in my size. So, in the end, it all will be used. ..forgot to mention my QUE on Ravelry and the pattern library that is there. When will I ever do the things that are there? I may be dead before it is ever done. All that said, my stash is big enough that I could knit for a long time without buying anything new, but where is the fun in that! LOL! No wonder it was next. Those colors are just gorgeous. My sister gave me at Knit’s End – Meditations… for my 60th in September, but got it this Christmas. I have enjoyed the short quips when I have been down in the dumps since my parents both died in and from a fire 4 years ago. Today I want to say thank you for the moments you have made me smile & sometimes even chuckle. Yes I have been an avid knitter since my Oma taught me to knit when I was 10. Since then I have gone through and given away various of stashes of yarn each time I move. But the positive addiction often catches me up when I go through down times. Thank you for you humorous writings. Take heart over the loss of your mom. Wanted to give you a solution for your SSS, or second slipper syndrome, second sleeve syndrome, or second mitt syndrome. I now knit these all on long round needles, in a figure eight format, both are complete at the same time with no seams. Another bug-bear of mine. For those readers who have not found it. Look for magic loop two socks, mitts, and I do sleeves, too at one time! And then my eyes landed on the box of yarn that arrived in the mail a couple weeks ago, and which been sitting on the edge of my kitchen counter since its arrival. Because I will be beginning the project for which I purchased it at ANY POSSIBLE MOMENT, so I don’t want to have to go all the way to my yarn stash in order to retrieve it. Funniest of all is that I just had my fourth baby (she’s a month old), which means I’m even less likely to begin said knitting imminently. All of which made me cackle, out loud, at myself. YUM! I want to have that yesterday.